November 7 Jan Anderson <https://fenelonstationgallery.com/how-does-a-fiber-artist-differ-from-a-quilter-jan-anderson/>Exercises for quilters: care, prevention, and rehabilitation for issues that plague quilters. 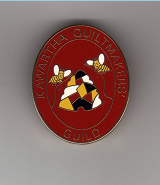 May 5 Kelly DuMaresq Trunk Show on Scrappy Quilts with a focus on "Taming our Stash"
The program committee is delighted to have the following members presenting mini-workshops at our meeting on March 6. Each mini-workshop will be 15 minutes, and will be presented three times, so that you will be able to choose to attend three of them. Sign-up sheets will be available before the meeting starts and at break, and the workshops will follow the break. Cheryl Devitt will be sharing information on HoopSisters, Lunch box and Anita Goodesigns, which are some of the patterns that create perfectly pieced, appliquéd and decoratively stitched blocks, and showing how they are created in a hoop on an embroidery sewing machine. Cathy Vickers will be showing an alternative to applique using tracing blocks, colouring and sealing crayon colour, layers of colour, and embellishment with embroidery, beading, and crystals. Pam Pilkington will be showing the participants how to work with woollen fabrics, and the appliqué of them to a woollen background. She will also be showing how to attach one fabric to another as well as how to use a variety of embroidery stitches to make a project attractive. A variety of resources will be exhibited, as well as a variety of threads etc. that could be used. Debra Graham will be showing the group how to use lightweight non-woven fusible interfacing (not be confused with paper backed fusible web) to appliqué. This method can be used for Machine or hand appliqué. Roberta Passmore will be demonstrating needle-turning. Helen Blaskievich will be demonstrating an applique method that is effective for small or "fussy" pieces, using light interfacing or, for those of us who like to recycle, dryer sheets (used). Bill will work us through four different approaches to create four 14 inch blocks: Traditional, Transitioning, Modern, and Improve (suitable for cushion covers) with materials he provides. Our presenter for February is Carol Rand, a local fibre artist who will show a range of her work. She is the secretary for the Embroiderers' Guild of Peterborough and is on the teaching roster for the Embroiderers' Association of Canada. Carol has been stitching since she was a small child, and produces a variety of work including hand-stitching, mixed media, fabric painting and repurposing of linen, cotton and wool items. She has a special interest in reproducing children's drawings and paintings on fabric and in using felted wool to create two and three dimensional embroidered pieces. The techniques she discusses will be inspiring to and helpful for quiltmakers. Spring Workshop: To be arranged.